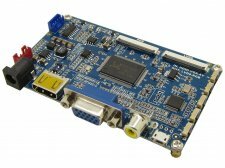 The board input can be work with HDMI, VGA or AV(CVBS). The HDMI, VGA and AV can be selected by the keypad. the input resolution is up to 1920x1080. it is very easy to use - simply connect a 5-24VDC adapter to the 2.1mm center-positive DC jack, it can works well with both TTL and LVDS screens, also support audio output. -Note: the vedio LVDS firmware and vedio TTL firmware cannot be working simultaneously, which means only one firmware can be selected at a time.